Not the sort of thing I’m used to hearing, but this is what a young lady exclaimed recently. I was just about to offer a proposal of marriage to her, when I realised she was only talking about the carp that was straining at the end of my fishing line. In fact, as carp go, it wasn’t exactly enormous, weighing in at 9.08. But it was a feisty fish and gave me a bit of a run-around before I could get it in the net. The young lady in question was on a canal cruise boat that happened to be passing at the time. Although the evening was young, I suspect she’d already consumed a fair amount of alcohol. 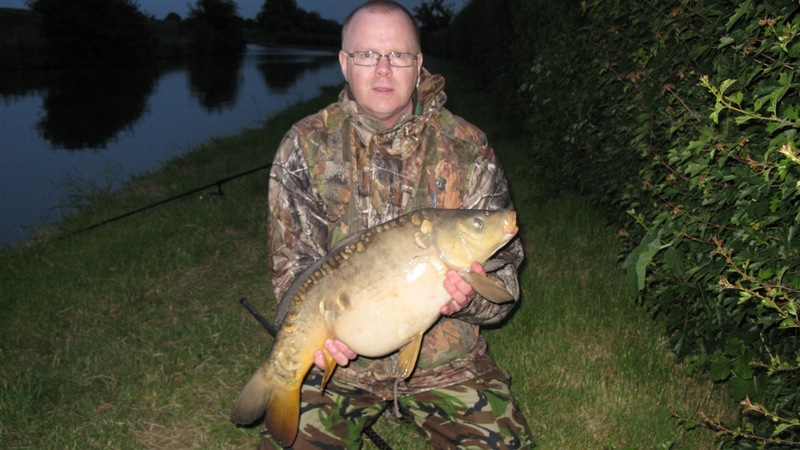 It turned out to be the last fish of a decent spell of canal carping during the break in the river season. In contrast to previous seasons where I’d failed to even get a bite, this year turned out rather successfully. Starting with a Sunday morning session with Andy P, my luck changed in quite some style, as I landed 9 carp to 14.02. 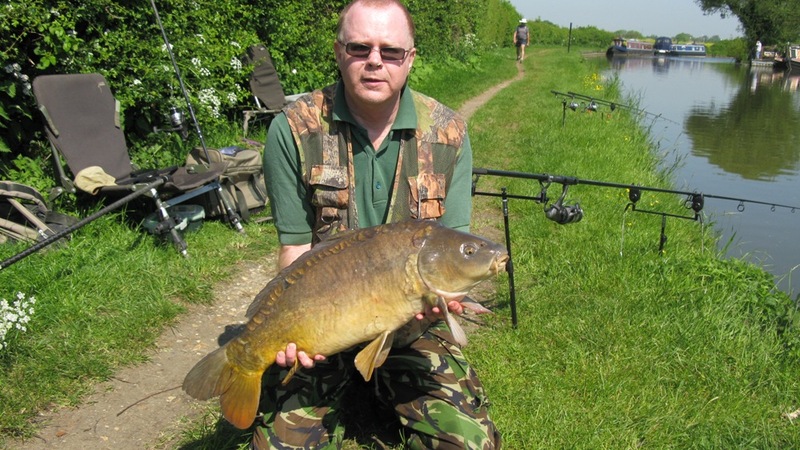 The catch also included two 8s and two 9s, all of which beat my previous best carp of 7.00, caught as long ago as 1974. Successfull baits were a white chocolate boilie on one rod (5 fish including the 14 pounder), and a robin red boilie fished as a “snowman” with a popup on the other (4 fish). At one time, I had two fish on at the same time, luckily Andy was on hand to assist. My two new Okuma Epix baitrunner reels were christened in fine style on their first outing then, as were my Black Widow carp rods – although it took a year longer for these to break their duck. Both performed well, especially considering the cheap purchase prices (both rods and reels costs around £35 each). Strangely, Andy, who was fishing just a few yards away, never had a bite. The next session, this time an evening one, saw me on the same stretch of canal, but in a different swim. I had five carp, including a mirror of 12.13, and two beautiful 9lb commons. All came to the white chocolate boilies, while not getting a single touch on the robin reds. This seemed rather odd, as the robin reds were positioned up against a large overhanging tree, where you’d suspect the carp would reside – and indeed at times I could here them “clooping” under there. Yet the fish I caught were from a more open area, with only some concrete blocks up against the far bank to act as any sort of holding feature. I wonder if they were wary of baits fished so close to their home, but were less concerned about baits in the open as they wouldn’t be used to being fished for there? Normal service was resumed on the third session, where I blanked, before the fourth and final session prior to the river season kick-off, being the one where that young lady was suitably impressed. So the canal-carping season ended with 15 fish banked, 9 of which were better than my previous long-standing carp PB, with the best of them doubling that old record. Now these may not be the biggest carp in the world by any means, but they did give me some good sport and it was great to finally break my duck on the canals, after 3 previous blank seasons. There was a mixture of mirrors and commons among the fish I caught, and it was interesting to note that the mirrors gave a much better account of themselves, pound for pound, than the commons. I don’t know why this would be, as they’re the same species. Andy says he finds this too, so it’s not just me.